From Vista onwards, the ‘File types’ tab is missing in the folder options of Windows Explorer. This makes the administration of fi le types diffi cult, e.g. the option to automatically change assigned fi letypes during program installations. You can manually change the program assigned to a file type. However, it is time-consuming and takes you through the registry. This can be tackled more comfortably with the free tool Default Programs Editor defaultprogramseditor.com. This requires the installation of the .NET framework from version 3.5 onwards which is available by default in Windows 7, and also downloadable from www.microsoft.com/net. After unzipping the ZIP folder, the file ‘Default Programs Editor.exe’ is ready on double clicking without further installation. In the start dialog, click ‘File Type Settings’ and then ‘Icon’. Now search for the desired file type in the list. This mostly works faster if you enter a part of the file type name or the relevant fi le extension in the search fi eld above. Then select the appropriate entry and click ‘Next’. The next dialog shows the current icon to be allocated and its source. To change, click ‘Browse’. In the ‘Other icon’ system dialog, select the character from the list or first determine another DLL, EXE or ICO fi le as the source for the icon selection. Confirm your selection with ‘OK’. 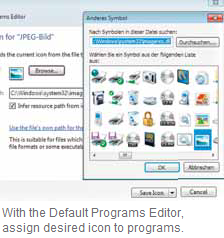 You will find numerous icons in the system files ‘imageres.dll’ and ‘shell32. dll’. With a click on ‘Save Icon’, you can directly accept the change in the registry. If you want to export the settings for further changes or the transfer them to another computer, click the arrow near ‘Save Icon’ and ‘Save to .reg file’. Enter a suitable filename and click ‘Save’. NOTE: With the tool, you can even configure the displayed ‘Description’ as well as the defined ‘Context menu entries’ for every data type apart from the file icons in a similar manner. Besides, the association of programs to file types can be processed interactively under ‘Default Programs Setting’. To have quick access to the program later, click the gear icon in the opening dialog and on ‘Install to Control Panel’ in the next dialog. You will then find the tool always in the Control Panel in the ‘System and Security’ section.